When I asked my girls what type of healthy snack they wanted to create for Valentine’s Day they immediately wanted to make a yogurt bark recipe. These are my favorite types of recipes because they are easy to make and the girls love being in the kitchen with me. The best part is that strawberry season happens around the winter months. Making it the perfect addition to any Valentine’s Day recipe. We picked these strawberries ourselves at our local strawberry farm and had the best time. Start by washing all of your strawberries and cutting off the stems. Add your 3 strawberries to a mixer to puree them. 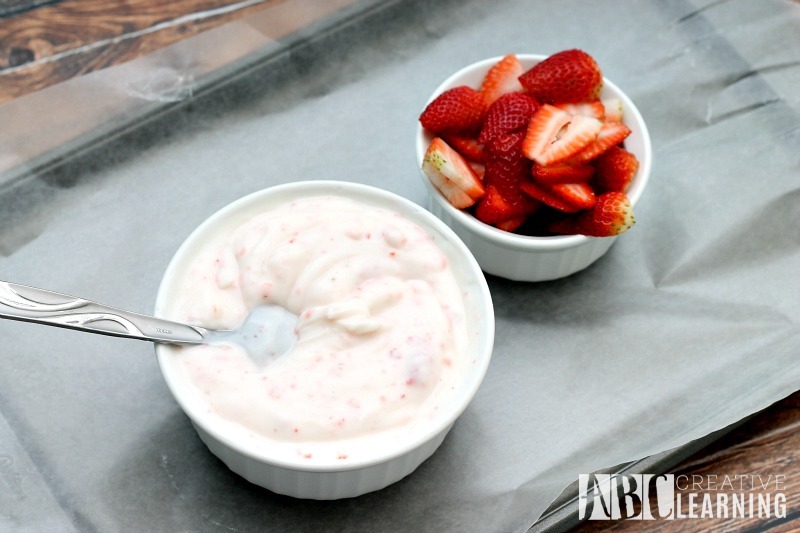 Mix your pureed strawberries with your vanilla yogurt, until you see that your yogurt becomes pink. I l love dyeing food naturally with fruits and vegetables. Lay a sheet of wax paper on your baking pan. Spread your yogurt mixture all on your sheet of wax paper. The thinner you spread it the thinner your bark will be. Next, slice the rest of your strawberries and add them right on top of your yogurt. No need to push your strawberries down. Put your pan in the freezer for at least 4 hours to harden. Once your yogurt turns into bark you are ready to break them into pieces. My girls love doing this part! Tip: If you are taking these yogurt strawberry bark to a party or your kid’s school, just keep them in the freezer overnight. Once your yogurt turns into bark you are ready to break them into pieces. This is one of my girl’s favorite recipes to make because they do most of the work. Plus, anything with yogurt in it they love. 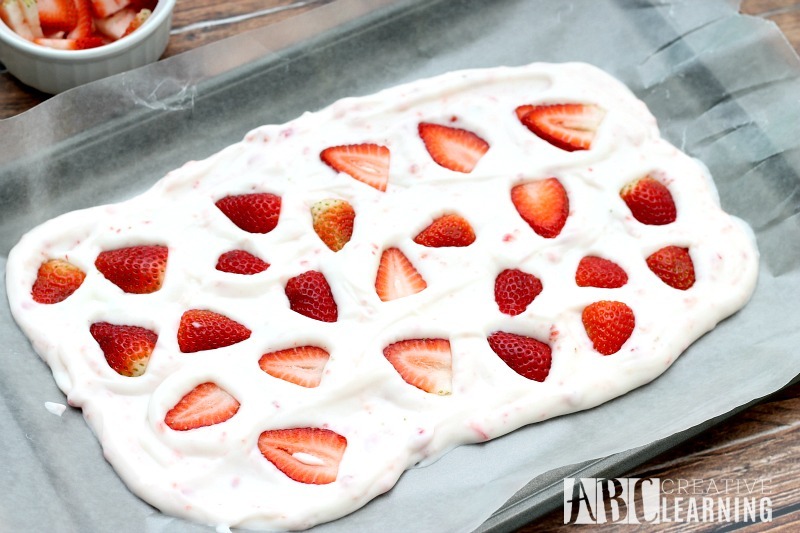 This strawberry yogurt bark recipe can be made for any time of the year. Especially those hot summer months. They make the perfect summer yogurt treat. What’s your favorite yogurt bark? That looks so good! I’m going to make that. I already have all of the ingredients and the wax paper. Thanks for the idea! 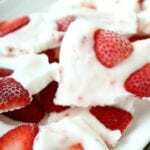 My girls love this snack and it’s super easy to make! Just my kind of recipe, LOL! Hope you all love it as much as we do! What size containers are saying use individual size, medium or the large containers?? You can use any you would like. I use large containers because it’s cheaper.